Today is the 20th anniversary of the fall of the Berlin Wall. It was not an isolated event, but the culmination of processes of change that had been at work for much of the history of the Soviet bloc. I saw the Berlin Wall at the age of 17. At the time, I was an avowed communist, eager to set foot in a country ruled by the ideology that I espoused and believed like a religion. The Berlin Wall was an awe inspiring sight. It was far more than a mere wall, incorporating mine fields, free fire zones and high tech obstacle courses. Its guards were frequently shuffled around so they would not be able to form conspiratorial friendships. When you took the S Bahn, the elevated train that went over the wall, you had a chance to look down on the wide stretch of no man's land that divided the two parts of Berlin. The official story was that the wall was being built to protect citizens of the "democratic sector" from capitalist infiltrators and saboteurs. It was a face saving lie that no one believed. What made East Germany a prison was not the drabness or lack of consumer goods. These were certainly a symptom of a dysfunctional economic system. One could not travel freely to West Germany or anywhere out of the eastern bloc. When the wall went up, some apartment buildings had to be bricked up on one side, since they were built on the border of the Soviet and the Western zones of Berlin. People literally went to visit neighbours not to borrow a cup of sugar but to jump out their windows to freedom. Bars had to be put in the sewers to prevent people from wading through city sewage to freedom. The country was built upon a web of informers. There was no limit to the depths of betrayal, no limits to the trivialities that could be seized upon by the secret police to destroy lives Der Spiegel reports as follows on an incident of betrayal that threw a family into poverty. "A West German pudding. That was all it took. Once the Stasi found out about it, a family breadwinner was fired from his army job and an East German household was plunged into destitution. Even worse, the family later found out that they had been turned in by a close friend. "She was watering the plants and went through the cupboards to find a Dr. Oetker dessert," Vera Iburg, who has worked with files kept by the East German secret police for the last 20 years, told SPIEGEL ONLINE, referring to the snoop. "What was she doing? She had no business there!" The first crack in the "iron curtain across Europe" was when Hungary quietly decided that they would no longer prevent citizens of communist countries from crossing their borders to the west. Thousands made the trip in their shockingly primitive East German cars. Word spread and people traveled to Hungary simply to cross the border. The border guard in Berlin made the decision to open the gate to West Berlin on his own, interpreting conflicting instructions with an independence that was totally uncharacteristic of the obedience that had characterised 40 years of communist rule. My father felt a love for Berlin and a pride in being born there that made the travails and division of that city resonate with me on a personal level. 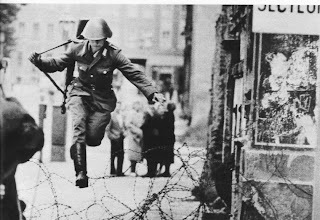 When the news of the Berlin Wall falling was broadcast around the world, it electrified me. communist power and the four power division of Berlin seemed powerful and immutable to me . To this day, I am in awe of what took place there. The fresh awe of the events of November 9 and 10 1989 make it feel strange to me speaking to those with no memory of the Wall. I speak to my children of the open miracles that took place in that year and feel acutely the passage of time when I realise that they have grown up in a different world than I. It is both a blessing and a curse that I spend much of my time nostalgic for times in which I never lived and homesick for places I have never been. The division of Berlin was for so many years a metaphor. There was something universally resonant about the feelings of unity that persisted defiantly in the shadow of the Berlin Wall. An incongruity of history is that November 9 and 10 are not only the 20th anniversary of the Berlin Wall's dramatic breach but of Kristallnacht, the state sponsored pogrom of 1938, in which Jewish businesses and institutions were burned and gutted across Germany and many Jews were attacked by well organised mobs and gangs. In a real sense, the day itself has for me an emotional wall built across it, with joy on the one side and profound sadness on the other. Being of German Jewish background, I feel a connection to both aspects of the day that leaves a wall across my soul that still stands to this day. Now that Germany is one country, East Germans are now finding out about the millions of betrayals, sometimes perpetrated by loved ones. People are still applying for permission to view their secret police files. Der Spiegel reports as follows on the lingering interest East Germans have in their secret police files. "In the last year, tens of thousands of people have headed to the Birthler Authority to finally take a look at what their Stasi files contain. Interest has been so high, in fact, the waiting list is now two years long. The files -- which occupy over 100 kilometers of shelf space (not including the 16,000 sacks of shredded documents the Birthler Authority is currently trying to reassemble with the aid of computers) -- are testament to a darker side of humanity. And Ziehm says that films like "The Lives of Others," which indicate that many were coerced into spying on friends and neighbors, don't come close to plumbing the depths that some ultimately fall to. Friends informed voluntarily on friends and spouses even tattled on each other." In my world, history and personal experience form a body of precedent by which I judge the present. When I tend to a sick child, I draw upon all the memories from 26 years of fatherhood to with G-d's help make a wise choice today. In a real sense, what I have experienced personally and what I have read and heard from others are threads of one cloth. There are news events that haunt me personally, such as the Rwandan genocide of 1994 and the JFK assassination. Watching my parents react to world events gave me a starting sense of perspective in viewing the world. I remember the emotion with which my mother reacted to the Kennedy assassinations and with which she spoke of Franklin Roosevelt. Then there were personal experiences that I have not been able to find in any library, such as arriving at work one day and finding that I was in the middle of an immigration raid. Then there was the Crown Heights riots of 1992. There was the taxi ride with a man from Soviet Georgia who told me back in 1984 how wonderful Stalin was. I tipped him generously, realising that such opinions were not likely to be found printed in the English language. When I walk down the street, I feel as though I am walking through a library. That is how I view people. And when I am in a library, I feel the presence of teeming humanity, of disparate books shelved together like strangers in a crowded street. I have had dreams in which I crossed the street in Brooklyn and ended up in Hungary. In the world of dreams, the border between life and death itself is torn down like a wall. When life makes no sense, I sometimes pretend that it is a dream and interpret it in that manner. November 9 and 10 are like a dream to me. It is only in the world of dreams that the sadness and terror of 1938 and the joy of 1989 enjoy some harmony. Today and tomorrow, which are both Kristallnacht and the day the Wall came down will be for me days in which the jumbled landscape of sleep marches into daylight. On of the more banal experiences of my life has been to have taken the SAT's. The instructions we were given was to answer each question and to skip any question to which we did not know the answer. Then we were supposed to go back and try again. Sometimes we would learn from other questions to answer the more difficult ones. The strategy worked fairly well on the SAT's but even better on life itself. There are many questions I skip and many to which I return regularly. The one thing of lasting value I extracted from my SATs was this metaphor. Witnessing Germany's evolving reunification today is a vivid reminder that liberation from an external oppression is the beginning and not the end of a struggle. I find this same theme in the Exodus from Egypt that is recorded in the Torah. It is often the walls within that are far more formidable and persistent than those which are erected by others. Before the Berlin Wall ever came down, there were those who dared to dream that it would one day be possible. If there is one lesson that stays with me from this day, it is that one must dare to dream. What can be seen in the mind's eye can indeed be brought to physical reality. Many strived for that day in 1989. Many died as well. And the collective strivings, with the help of a Greater Hand reached an awesome fruition. Keep faith. There are miracles yet to come.